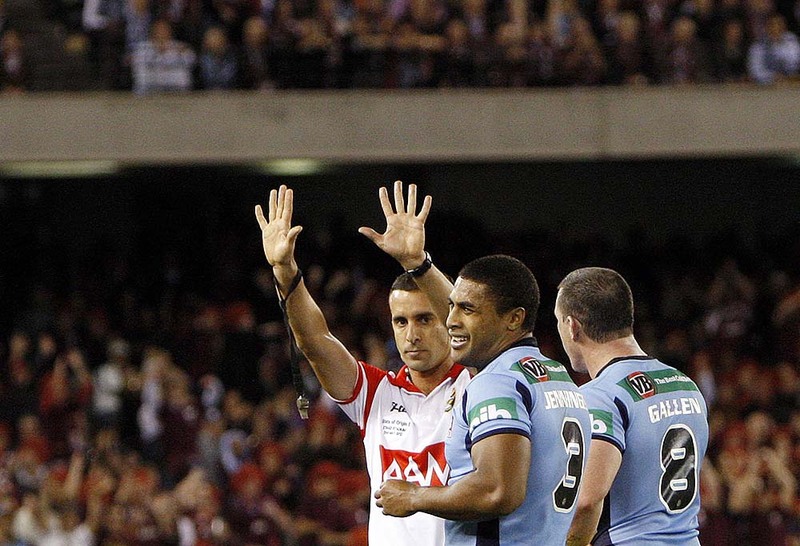 How many games of rugby league did you watch on the weekend? Usually when someone asks me that question, I answer with three or four at least. This weekend, I watched one game – the least I have watched in many years. It was only my sheer devotion to the Parramatta Eels that saw me tune in to their game against the Gold Coast Titans on Saturday afternoon. I got to a point this weekend where I just needed a break (and that’s unfortunate because it meant that I missed some cracking games of footy). I didn’t need a break from the game that I love, but instead I needed some time away from the ravenous pack of wolves that are particular sectors of rugby league media, intent on doing whatever they can to hurt the game that I grew up with and love so much. Last week, Andrew Webster wrote a piece about Matt Cecchin – a man many consider to be the best referee in our game. He is certainly one of our most experienced referees. 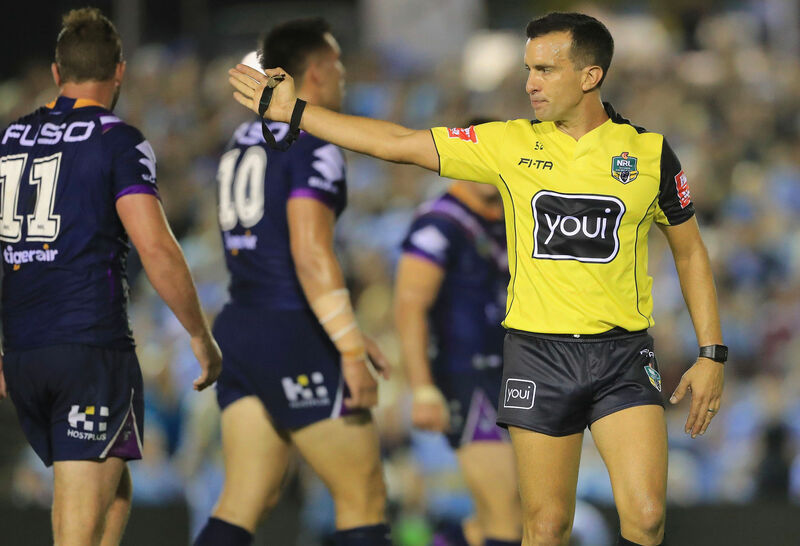 This weekend he refereed his 300th game when he took the field for the game between the Penrith Panthers and the Canberra Raiders. Unfortunately, at the end of this year Cecchin will be lost to the NRL because he has had enough and made the decision to retire. I certainly don’t blame him especially when you consider the noise surrounding him this year. It all started last year during the Rugby League World Cup when Cecchin and members of his family received death threats following what was perceived to be Cecchin making an incorrect call in the semi-final between Tonga and England last November (its worth noting that Cecchin made the correct call). It has continued this year, particularly following a game earlier this year where Cecchin blew 33 penalties and a fight erupted later in the game. That article made me sick. When did rugby league fans turn into people like that? When did we turn into people that think it is appropriate in any circumstance to threaten a human being involved in our game because you think they made a wrong call or made an error of judgement? When did we forget that referees are human and make mistakes just like the rest of them? When I read that article it was one of the few times I have been ashamed of the game and some of the people that support it. To be fair, I don’t blame fans completely for this. I also blame some sectors of the media who use their platforms to whinge and whine about every 50/50 refereeing decision that is made and to hang the referees out to dry whenever they make an incorrect decision. We’ve all seen it on countless occasions. And it needs to stop. Because when those with influence in the game carry on like pork chops, it gives other people the licence to do the same and creates a wave of ill sentiment towards our officials. Unfortunately, though instead of the media coming out and admitting that they have a role to play in this unfortunate situation we have found ourselves in with officials, we have instead had many members of that pack of wolves come out and wipe their hands clean of the whole mess. They say they are there to commentate on the game. Or that they feel sorry for the referees. But then they take every opportunity they can to put the boot in. 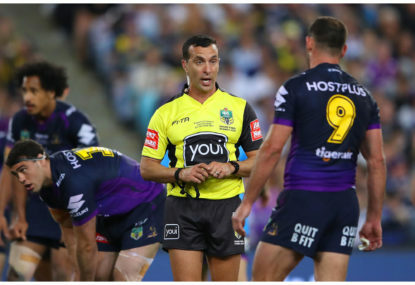 There were few media commentators that I wanted to applaud this week on social media, but one of them was Warren Smith who tweeted that as part of the media he needed to accept his role in contributing to a narrative where referees have become the centre of attention in our game. When did we stop commentating and commenting on the actual footy? When did we stop finding joy in the amazing feats of our incredible players? When did some parts of the rugby league media become boring, old, whiny sooks? When did plenty of the remainder become former players without media skills or training? It’s not something that I like and it’s something I think that we, as a game need to fix quickly – even if it means revoking media access for some of the old guard and seeing if they can use their large reach to do something positive instead of denigrate the game that puts food on their table. Here is what I am committing to. I am one voice. But I promise that I will never use that voice to denigrate an official or to carry on like a pork chop when I think an incorrect decision is made. I will also make a better effort to understand the rules of the game, so that rather than taking what commentators say at face value, I can make a decision for myself. I also commit to no longer clicking on articles that shame or denigrate referees or contribute to a pack mentality which sees fans given licence to attack a referee. I am asking you to do the same. Because our game cannot take place without referees. And if our referees cannot do their job or are fearful about making a decision because of backlash towards them or their families then we will very soon be in a situation where we do not have young men and women putting up their hands to referee our game. And if you are someone who thinks that it is appropriate to threaten a referee because of a decision they have made on the field, then I have a really simply message for you – go and don’t come back. Because you aren’t welcome in rugby league. Rugby league is a family and I want to be part of a family that supports each other and helps every part of the game to get better. Not part of a family that will lead target our officials just to get a few lousy clicks.